Lo Han Chai, Chap Chye or Buddha’s Delight. 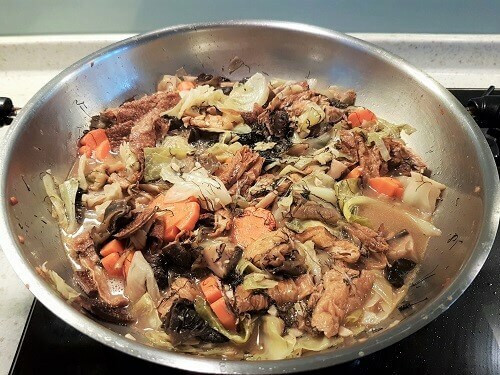 Whichever name it is called, it is the same mixed vegetables stew traditionally cooked and eaten by many Chinese household on the first day of Chinese New Year. There’re many variations of this well loved vegetarian dish with some even adding meat and seafood. Growing up, my aunties would cook this on the first day of CNY and it was meatless so I’m partial to the vegetarian version. 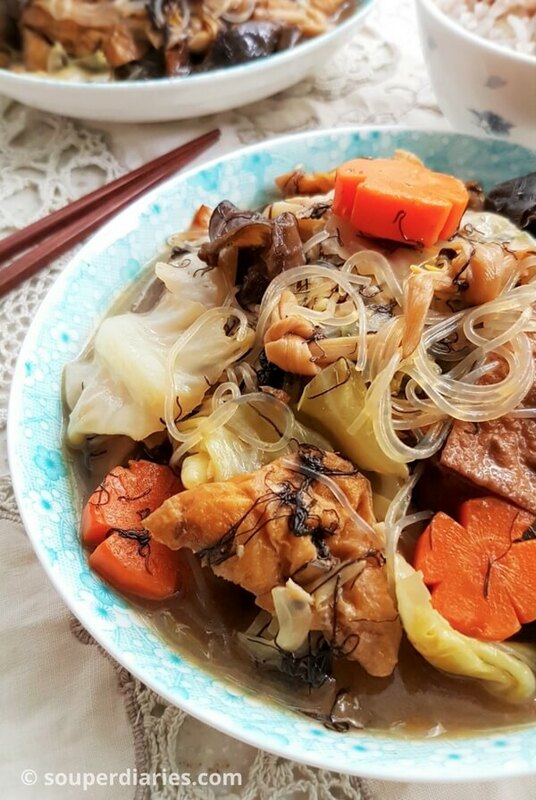 What makes this vegetable stew special is its use of fermented bean curd (either red or white) or fermented yellow bean paste as the main seasoning. This provides a unique savoriness and imparts a wonderful taste to the dish. The long list of ingredients from fresh to dried further enhances the dish with interesting textures and flavors. Just like Jiu Hu Char (another traditional CNY dish), Lo Han Chai is quite easy to cook but it requires lots of preparation work. 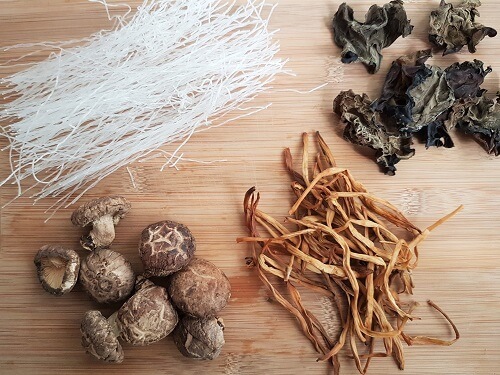 They’re usually made with at least 10 ingredients and many of them are made up of dried sundries like Chinese mushroom, black fungus, dried lily buds & glass noodles, etc. These have to be soaked before cooking. 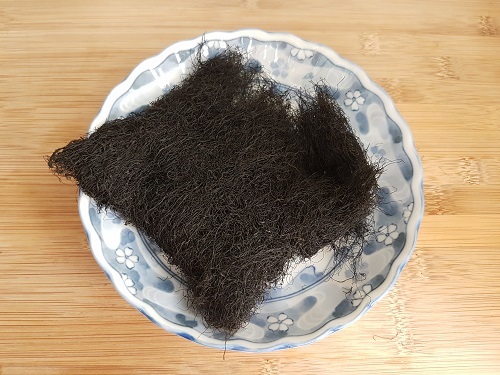 Below are the staple ingredients used in Lo Han Chai. #1. Cabbage – A must have. Use round white cabbage or napa cabbage. #2. 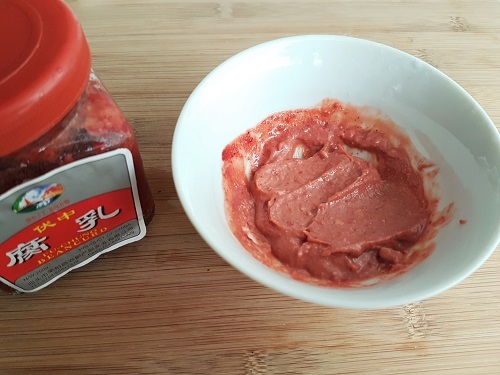 Seasoning – The three commonly used are fermented soy beans (tao cheo), red fermented bean curd (nam yee) and yellow fermented bean curd (fu yee). Apparently, Hokkiens would usually cook this dish with red fermented bean curd while Nyonyas would use tao cheo. My late mother (who was a Hokkien) used to cook her vegetarian stew with fermented bean curd so I am following her style. #3. Protein. There’s always some kind of protein in this dish whether it is in the form of tao pok, beancurd sticks, beancurd sheets, tofu, mushrooms, etc. The 2 types of tau kee. 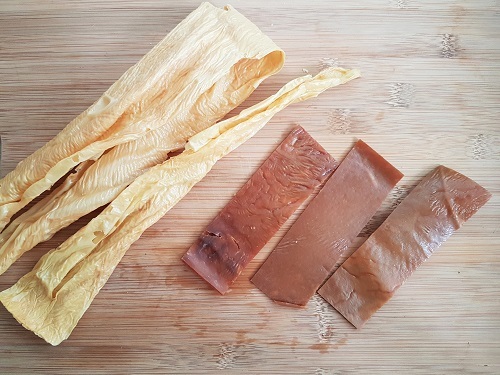 From left: Bean curd stick and sweet bean curd sheet. Lightly fry them till slightly blistered. 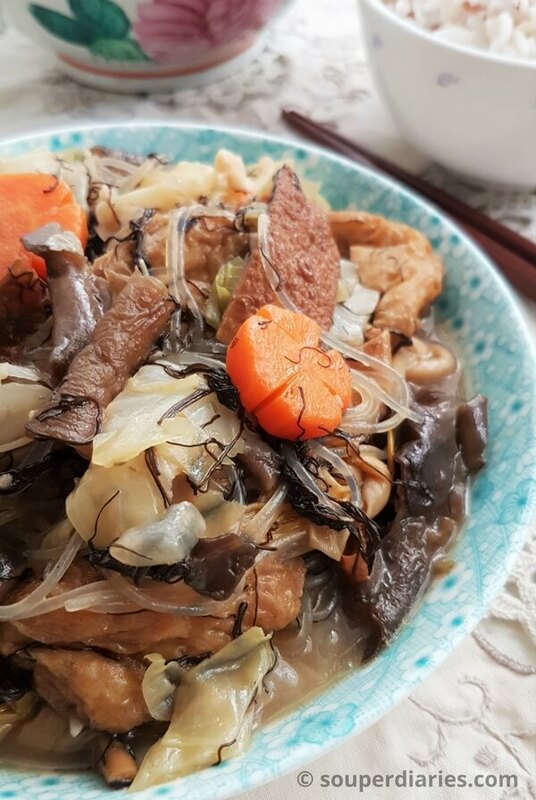 I like to cook the black fungus, lily buds and shiitake mushrooms with the fermented bean curd first before adding the rest of the vegetables. That way, they can absorb the oil and the seasoning better. Writing about this dish brings back memories of my late mom. She was a Buddhist and would eat vegetarian food on the 1st and 15th of every month. Her passion wasn’t in cooking (gardening was her forte) but she loved food and enjoyed eating. How I wish I could cook this for her! This Lo Han Chai recipe serves as a guide. You can add or replace the ingredients as you wish. A delicious mixed vegetables stew made with a variety of vegetables and soy bean products. Tradiionally eaten on the first day of Chinese New Year, it is also a highly versatile recipe with either simple or elaborate ingredients. Drain soaking water from lily buds. Squeeze dry and tie each of them into a tight knot so that they won't loosen easily during cooking. Cut the hard ends from mushrooms. Gently squeeze dry and cut into thin slices. Heat up oil in wok till hot. Lower heat to low and briefly fry the bean curd sticks and sweet bean curd sheets till light brown and blistered. Do not overfry as they cook very quickly. Drain oil and set aside. Pour away excess oil into a small bowl till about 3 tbsp remain in the wok. Fry the minced garlic till fragrant. Add mashed red fermented bean curd and fry till aromatic. Add the black fungus, lily buds and mushrooms. Stir fry and mix the ingredients well with the oil and fermented bean curd. Add just enough water to cover. Bring to a boil and let simmer for around 3 minutes. Add cabbage, carrot, fried beancurd sticks and sweet beancurd sheets and tao pok. Mix everything well. Add just enough water to make a sauce (including mushroom soaking liquid) and bring to a boil. Don't add too much water. This is not a soup. Then reduce heat. Add black moss and sauce ingredients. Cover the wok and gently simmer till the ingredients are soft. Taste and add salt or soy sauce if necessary. Add the glass noodles in the last 2 - 3 minutes of cooking. Turn off heat. Serve hot with some rice and sambal belacan. Tho photos look amazing !! I’d love to have a bowl of that in front of me right now. Asian cookery fascinates me, I’ve worked as a chef but I’ve had little to no experience cooking this food. 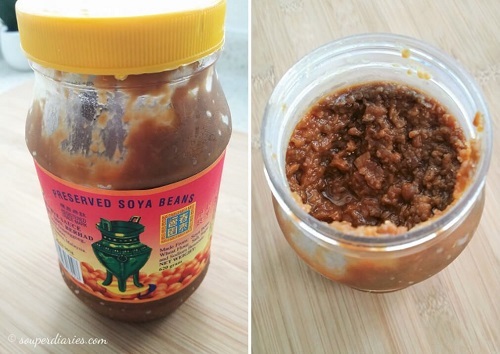 I will definitely give it a go as the fermented bean curd has interested me. Is it easy to get hold of? Thanks for your comments. Yes, you should be able to find fermented bean curd in the Asian section of a supermarket. Most Chinese grocery shops sell them too. This looks delicious… Can’t wait to try this recipe! WOOOoOW! This looks DELICIOUS!…. WELL worth the time! Wow! Thank you for the information. It’s nice to see the kind of wok pan I’ll need for the recipe too. Can’t wait to try it!